IT'S difficult to imagine how the surreal and ephemeral world of Mushishi, based on the award-winning manga by Yuki Urushibara, can be translated into a live action movie. After all, Mushishi is about a man called Ginko who roams from village to village in alternate ancient Japan to solve problems caused by invisible creatures called mushi. But we now have an idea. Head over to the official website at www.mushishi-movie.jp for a look at the trailer. Cinempire (www.cinempire.com/multimedia/mushishi/index.html) has photos of the movie as well. Ginko is played by Jo Odagiri while Yui Aoi, who played Hagumi Hanamoto in the Honey and Clover live action movie, will play Tanyu a girl with a mushi in her. 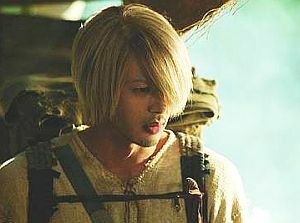 Jo Odagiri plays Ginko, a ‘mushishi’ who travels around ancient Japan solving mysteries in the live action adaptation of the manga of the same name. And the music? (I could've sworn I heard a didgeridoo playing in the background!) Wow. According to Anime News Service, the movie is set to open in Japan next Saturday. The film was shot over a three-month period but production took two years to complete. After its premiere at Venice Film Festival, over 30 countries have stepped in to distribute the movie. No word so far from our local movie distributors whether they're bringing the movie over to our big screens, though. THE popular 31-volume manga by Takehiko Inoue about the antics of a Japanese high school basketball team will be turned into a live action movie! According to Variety.com, Hong Kong's Emperor Motion Picture and Japan's Kadokawa Herald Pictures have teamed up to adapt the manga into a movie, and it will be shot in Shanghai and Taiwan. The stars of the movie are familiar names to fans of Asian cinema: Taiwanese pop star and actor Jay Chou, who was last seen in Curse of The Golden Flower, Charlene Choi (Twins Effect) and Chen Bo-lin (A Chinese Tall Story). Jay Chou previously played another manga character: racer Takumi Fujiwara in Initial D. We are not sure who he plays in Slam Dunk, however. Slam Dunk sold more than 100 million copies in Japan and has been made into a popular anime by Toei Animation.